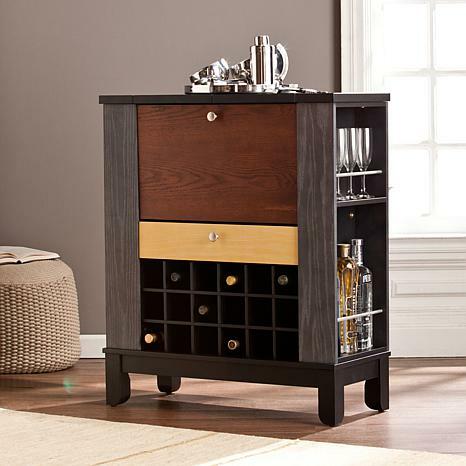 Color outside the lines with this colorblocked wine and bar cabinet. Compact, fold-away design keeps entertaining essentials organized inside a sleek black body accented by gray wash, natural oak, and espresso wood grain panels. Cubby style wine rack holds up to 18 bottles of your favorite labels, side shelves are perfect for larger bottles and stemware, and bar accessories slide right in the convenient drawer. Cabinet door pulls down and top panels flip open for extra full bar storage.